It was probably only a matter of time before Angry Birds mad the transition to an actual toy line. K'Nex has just that up their sleeves for this Fall with a full assortment of building (and knocking down) sets. I have to admit, I've never really 'gotten' the appeal of Angry Birds. It's fast become the best selling App of all time. I'm sure that stat places the game in very good company as far as videogames go in general as well, as that's a pretty gaudy statement. With that kind of notoriety, the game has absolutely exploded into the physical space with just about every kind of collectable, plush toy, and knick-knack that you can imagine. This new line from K'Nex has the privilege of maybe being the first one that actually makes sense. Since it's a building toy (and therefor a 'knocking down' toy) it fits squarely in with the theme of it's namesake. Favorite characters will fly off the screen as kids build and interact with the Angry Birds world! Fans can choose from one of four fun sets: Red Bird vs. Small Pig, Yellow Bird vs. Medium Pig, Black Bird vs. Small Pig, or Blue Bird vs. Helmet Pig. 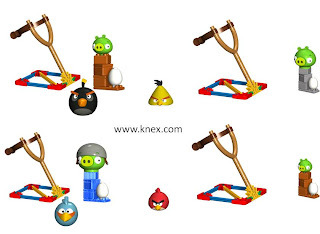 Every set also includes a fully functional buildable launcher, a white egg accessory, and is compatible with all K’NEX Angry Birds sets. Builders can even use the packaging as an added obstacle! Once built, use the launcher for real-life Angry Birds fun! Suggested retail price is $10.99 each. Ages 5+. Available fall 2012. 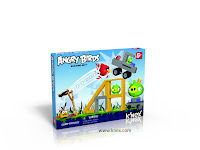 With over 170+ parts the Angry Birds fun comes to life with the Danger Above building set! 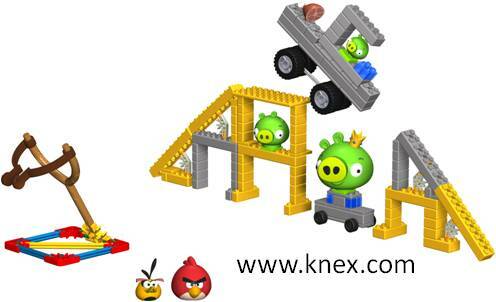 Avid Angry Birds fans can build and then knock down this structure, just like the mobile game! Set includes enough bricks to build a large structure to destroy, a fully-functional buildable launcher, and 2 birds: Red Bird and Orange Bird. Also includes 3 pigs: Small Pig, Medium Pig and King Pig, and a bonus ham accessory. Building set is compatible with all other K’NEX Angry Birds sets. Suggested retail price is $29.99 each. Ages 5+. Available fall 2012. 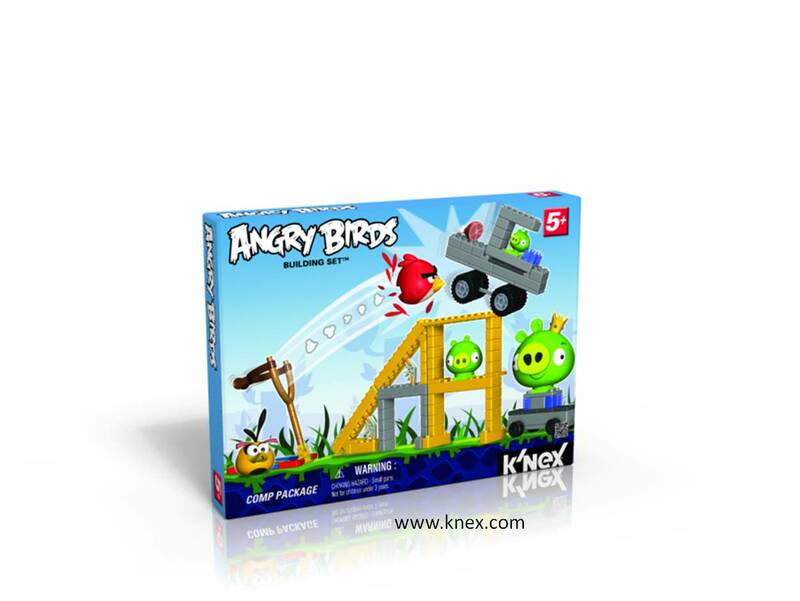 The excitement of the Angry Birds world comes to life with the T Minus Never Building Set from K’NEX! Kids can build and then knock down structures—just like in the game! 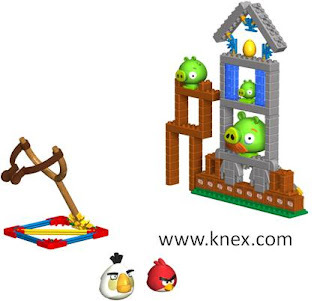 Set features 170+ parts to build and “destroy” and includes 2 birds; Red Bird and White Bird, a fully-functional buildable launcher and 3 pigs: Small Pig, Medium Pig and Moustache Pig, plus a bonus Golden Egg accessory! Building set is compatible with all other K’NEX Angry Birds sets. Suggested retail price $29.99. Ages 5+. Available fall 2012.